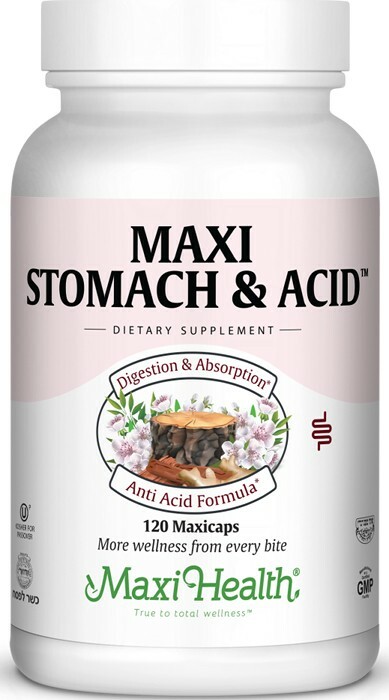 Maxi Stomach & Acid is a full spectrum, kosher for Passover and all-year-round antacid formula. It helps ease acid distress and to comfort the stomach. That's not all because, it supports digestive and absorption of food as well. We have included Slippery elm, Chamomile, Licorice, Marshmallow and Ginger.The ingredients you seek by the supplement company you can trust. Keep a bottle of Maxi's Stomach & Acid on hand for your family.